The microprocessor-controlled infrared sensor IS 300 from STEINEL is a setter of new standards in the field of infrared sensor technology. The extremely large angle of coverage, electronic reach stabilisation, comprehensive configuration capabilities and the intelligent, attractive enclosure concept are the distinguishing features of this infrared sensor. Three integrated pyro detectors sense any movement in a radius of 300°. 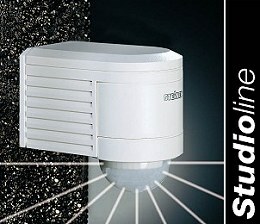 This means the ST 300 can even see around corners (of buildings). The vertical opening angle is 180°. The sensor head can be swivelled through ± 80° for precision targeting. Specific areas can be excluded from detection by clipping on shrouds that are supplied with the sensor. The electronic reach stabilisation feature ensures that the ST 300 operates perfectly when temperature fluctuates and the range of 12 m is achieved irrespective of the weather. The switching capacity of this hi-tech sensor is matched to the large detection zone: the IS 300 can cope with up to 2000 watts without any difficulty. This means it is also easily possible to automate large lighting systems comprising several lights. Using easily accessible setting controls, light threshold and 'on' time can be varied across a wide range to meet individual needs. Time setting: 10 sec. - 15 min.